Do many readers approach an anthology by starting with the first poem and reading steadily through in the order chosen by the editor? I suspect not, even when an anthology has been edited with this route in mind. Michael McKimm sets out the raison d’être of this anthology in a three-page introduction, explaining both the commissioning and his approach. 2017 is the 800th anniversary of the Charter of the Forest, a companion to the Magna Carta; to mark this, the Woodland Trust and related organisations will publish a new Charter, setting out how people and trees benefit each other, ensuring the protection of trees, and people’s rights to the benefits of woodland. This anthology, as McKimm tells us, complements that work. So much for the background. Now to the poetry, and how this anthology was brought together. It’s the editor’s skill to make it more than the sum of its parts, and McKimm succeeds. No familiar or long-established poems from the canon here; these are all new poems written by invitation in response to the 1217 Charter, or to trees of personal significance to the poets,. In his introduction McKimm describes his first awareness of the structure of the anthology – the scaffolding which would hold it together. As the poems arrived they gradually formed themselves into three groups, and these became the separate sections: ‘Trees’ – about individual trees; ‘Woods’ – about trees en masse, both in place and time; and ‘People’ – about how trees shape who we are, our society, our culture. Within each section he has arranged the poems so that they reflect different aspects of each theme, as though they are in conversation with each other. With sixty-four poets (and seventy-one poems) there is inevitably some unevenness; an editor can only work with what the contributors send and the art is to find ways of bringing out the best in each poem by ensuring it has good neighbours. McKimm handles the task of placing poems with tact and delicacy so that they are not competing but complementing each other. 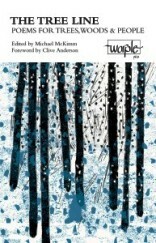 At best the poems are not simply ‘about’ trees but suggest the larger world of which trees are a vital part. for us, in their green tolerance. upon a time was a croquet lawn. a nest in me. Nobody will ever call me home. of the old world, the dark, fierce freedom of trees. In reviewing this anthology – any anthology – I am conscious that in commenting on only a selection of the poems I am in effect compiling an anthology of my own, with different emphases. So be it; this is a book for readers, offering simultaneously the real trees and woods known to the poets and routes back into our own memories, trees (and people) we have known. It reminds me, yet again, that if I care for trees as I say I do, I should know more about them and their world that parallels ours. This anthology is a good place to start.